By the end of the one-night only concert on Saturday, February 27, the shock was over. Grand Rapids Symphony swung long and hard for the 16th annual event with music including “Victory Stride” by James P. Johnson and “First Fruits of the Harvest” by Stewart Goodyear, led by Music Director Laureate David Lockington, who launched “Symphony with Soul” in 2001. Marcus Roberts, who rose to prominence, first with Wynton Marsalis and Jazz at Lincoln Center, and as the first winner in 1987 of the inaugural Thelonious Monk International Jazz Competition, is a shining example of diversity and inclusion several times over. At age 5, the native of Jacksonville, Florida, lost his sight, a victim of cataracts and glaucoma. But Roberts attended Florida School for the Deaf and Blind -- a school that also helped launch the legendary Ray Charles – learned to play piano, first on his own, later through formal studies in classical piano at Florida State University. Today, Roberts is an assistant professor of jazz at his alma mater and a celebrated solo artist. Roberts’ original interpretation of “Rhapsody in Blue” brought the house down with the most raucous, most bluesy, most free-wheeling approach to Gershwin’s wildly popular work for piano and orchestra. Departing several times from the original score, Roberts cut loose on lengthy improvisatory interludes with his right hand while, interspersed with snippets of Gershwin’s original melodies in his left hand. Earlier in the evening, nearly 360 guests were at the “Celebration of Soul” gala dinner honoring Stephen & Clarice Drew, Huntington Bank, and BL2END with the MaLinda P. Sapp Legacy Award honoring individuals and organizations for their efforts in promoting diversity and inclusion in West Michigan. Stephen Drew, a lawyer who founded Drew, Cooper & Anding, is an attorney specializing in civil rights and discrimination cases while Clarice drew is a community activist, serving on the boards of Grand Rapids Symphony and Grand Rapids Ballet. Huntington Bank is a leader in supporting neighborhood development and investing in education and the arts. BL2END, a grassroots, non-profit created in 2006 by Grand Valley State University alumni, fosters an environment to connect young professionals of color. 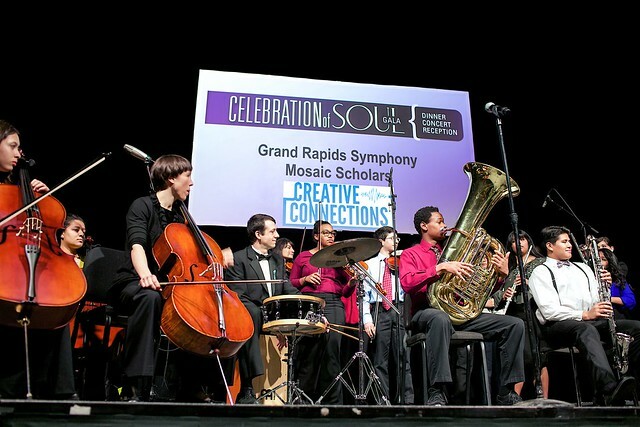 Skot Welch, a co-chair of the Celebration of Soul, introduced “Symphony with Soul” with the reminder that proceeds from both events go to support Grand Rapids Symphony’s music education programs. Beginning musicians from the Ellington Academy charter school in Grand Rapids played variations on “Twinkle, Twinkle” while advanced students from the Grand Rapids String Academy played the Vivace from J.S. Bach’s Concerto for Two Violins in D minor. Together, both groups plus the Mosaic Scholars performed an original work led by creative Connections director Jill Collier Warne. The evening of jazz and blues, gospel and spirituals featured the 90-voice Grand Rapids Symphony Community Chorus singing several spirituals plus Davis’ original work, “The Call,” for chorus and orchestra, joined by the Marcus Roberts Trio.